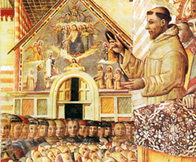 According to the tradition, during a night of 1216 after Christ, San Francesco received the visit during a prayer inside the Porziuncola of the Christ and of the Saint Mother; to them the Saint asked that to each person, repented and confessed, that would have visited this church all the faults should have been completely forgiven. From this year on, after having received the authorisation directly from the Pontificate Onorio III, on August 2nd takes place in Santa Maria degli Angeli the Celebration of the Pardon. The catholic Catechism establishes nowadays that, in order to receive the plenary indulgence for oneself or a dead person, it is necessary to make a sacramental confession in order to be in the Pardon of the Christ during the week preceding or following August 2nd, to participate to the Mass and to the Eucharistic Communion, to visit the Porziuncola with the profession of faith of the Credo, the reading of "Our Father", of a prayer dedicated to the Pontificate and a prayer for the Pope himself.